I have been on a diet since the beginning of March. Nothing fancy or faddish in nature. I am not drinking wheat grass smoothies and getting espresso enemas. It has just been counting calories, watching portion size, and working in some exercise. I haven't changed what I eat a bit and I am almost 30 pounds down. Looking good if you ask me. But, one of the big secrets to good dieting is to not deprive yourself. If you want something, eat it. Just don't eat five of them. 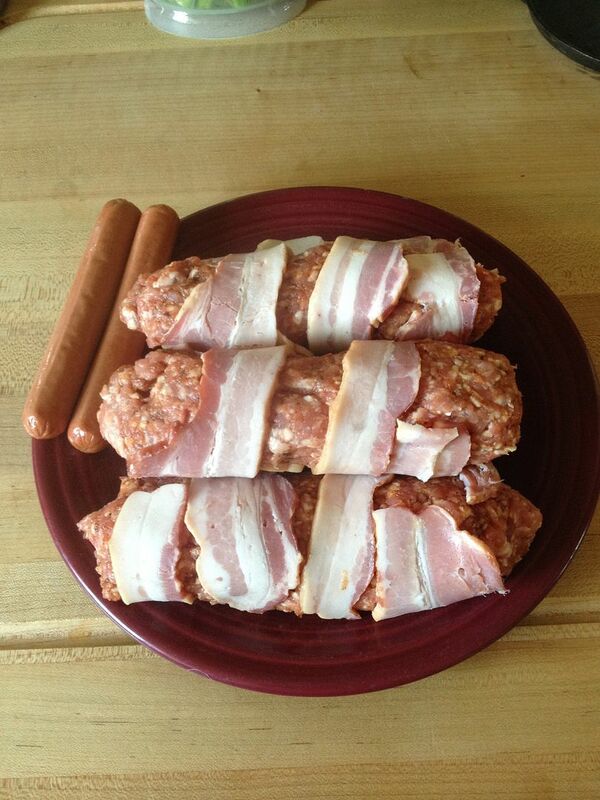 This leads me to our post today: the Mega Meat Dog. I have wanted a hot dog for awhile. I also had come chili sauce stored away in the freezer. 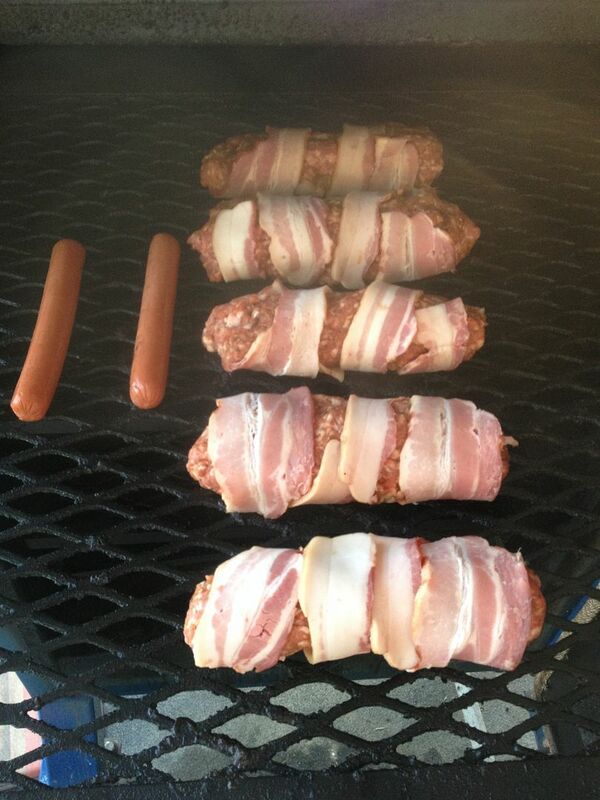 As I was tooling through the BBQ pages in Facebook, I saw someone make a creation like I am about to show you. The minute I saw it, I decided this was going to be a splurge dinner one day after I mowed the lawn. Something to reward myself. 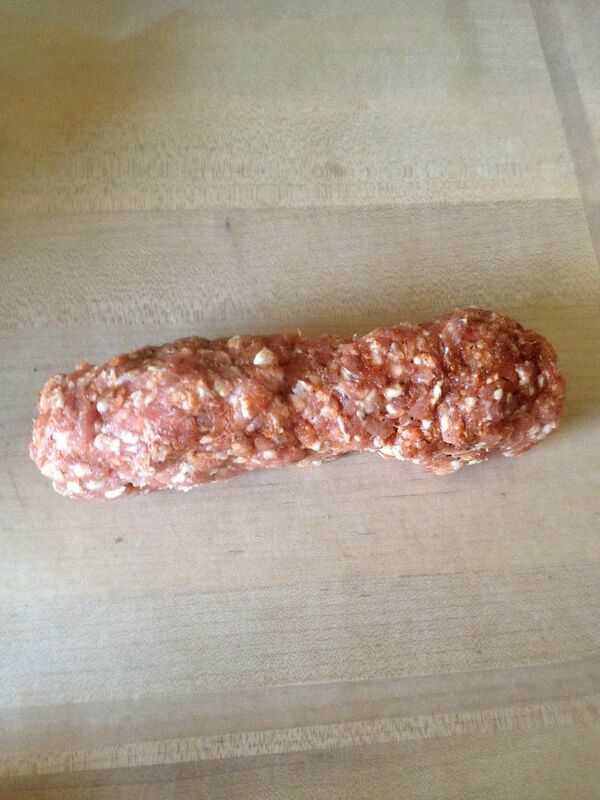 So, I give you, the Mega Meat Dog. First, I bought two pounds of ground pork from my butcher and one pack of kosher beef hot dogs from the local grocery store. 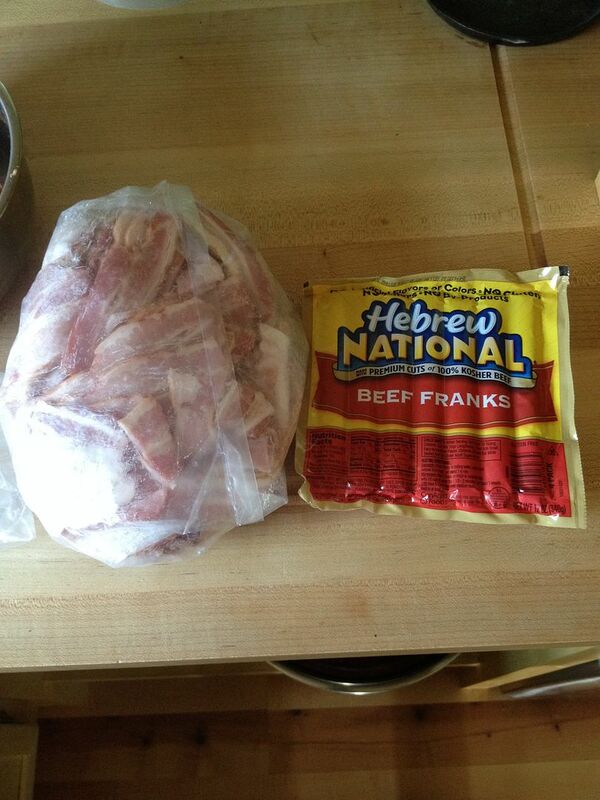 I also had some bacon lying around as well. Next, I took the ground pork, placed into a large mixing bowl, and incorporated three tbsp of BBQ rub for pork. You can use whatever you have on hand. I used Oakridge Secret Weapon Pork and Chicken rub. After the pork was ready, I took a decent sized ball of meat, about three ounces, placed into a quart sized plastic bag, and mashed it flat. 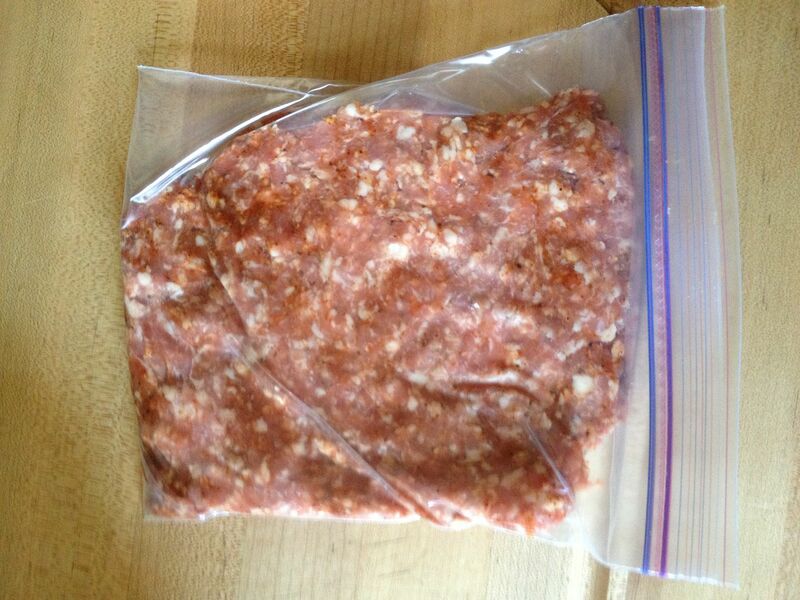 Then, I cut open the bag, placed the hot dog in the middle, and wrapped the pork around the hog dog. 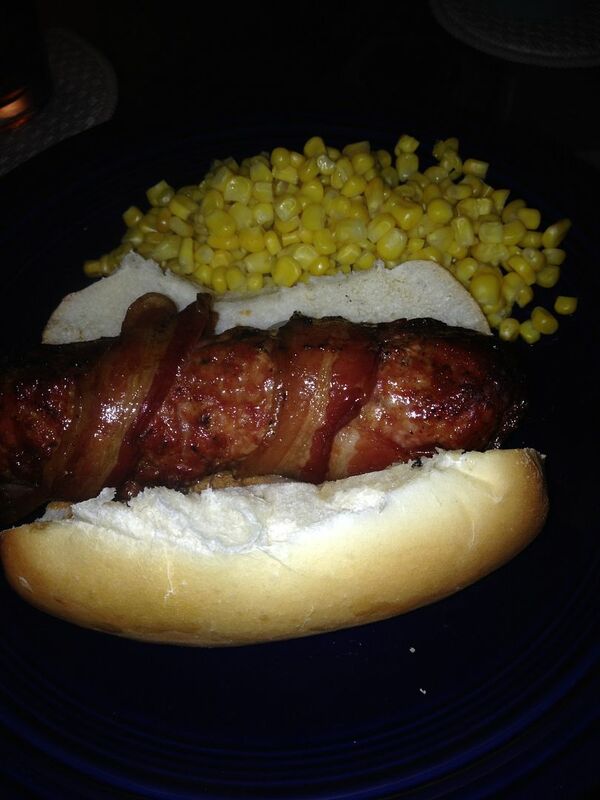 If that wasn't enough meat product, I then took two slices of bacon and wrapped that round the outside of my pork encased hot dog. I lit my smoker and brought to 300 F and placed some hickory in the ash pan. Then, I placed these meaty delights on the top rack to cook. While these were cooking away, I retrieved the chili sauce from the freezer and warmed up on the stove top until hot and bubbly. For good measure, I finely diced a sweet onion to use for a topping as well. 45 minutes later the bacon was crispy and the ground pork was cooked. Time to bring these gut bombs inside and assemble. No standard hot bog buns here. They could be too small and easily torn. I needed something that could hold Megadog and some chili as well. Therefore, I purchased some nice sausage rolls to encase these treats. 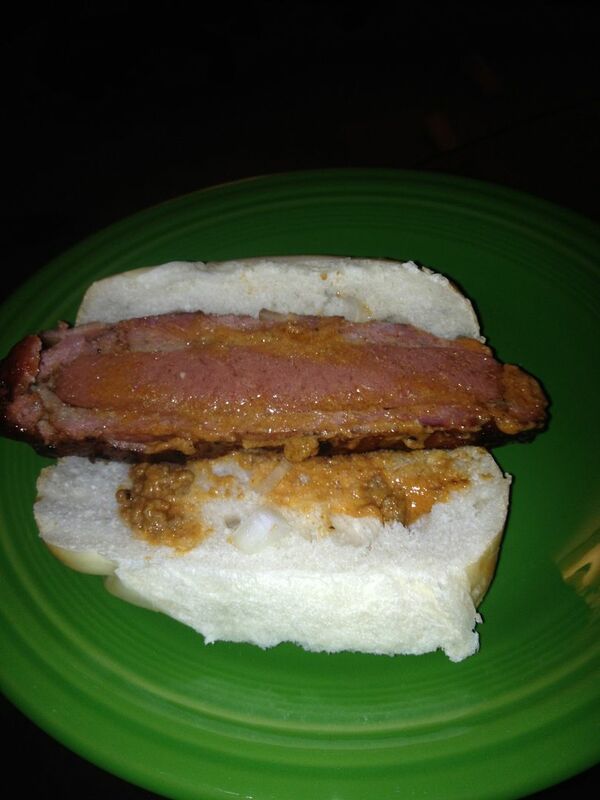 I spread some chili sauce on the bottom of the roll along with some diced onion, then I nestled a bacon wrapped, pork encased, beef hot dog on top. Oh, and I threw some corn on the side to make my place look somewhat healthy. After one, I was stuffed. Hope had a half. The Mega Meat Dog even took its measure of the youngest. Ty could only manage one and a half of these decidedly non-vegan treasures. The bacon was perfectly crisp. The ground pork was seasoned nicely and developed a nice smoke flavor. After each bite, the hot dog within added a nice finish that only a previously kosher dog can do. The chili sauce only added to the meat party going on inside this bun. If I had only made some slaw for the top of this hybrid dog. This creation will be a very rare treat around the Three Dogs household. Once or twice a year perhaps. 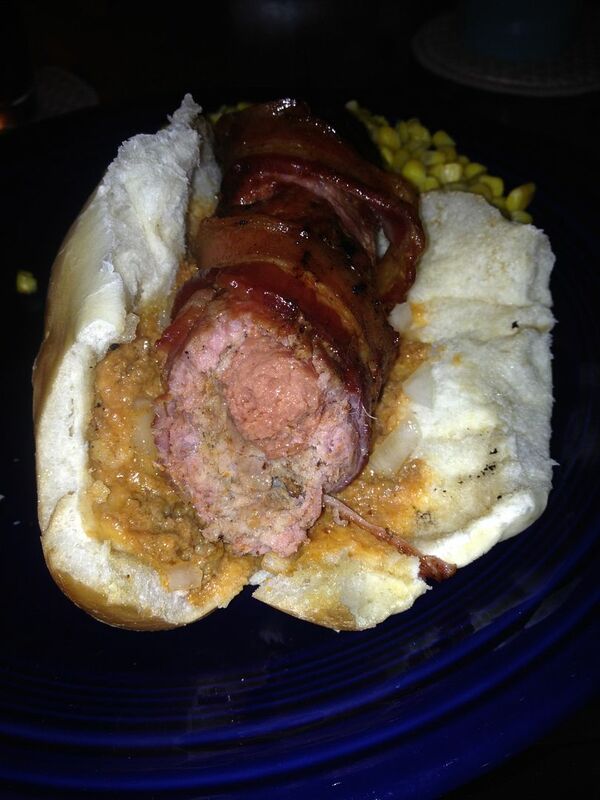 The Mega Meat Dog even scared my carnivore wife. 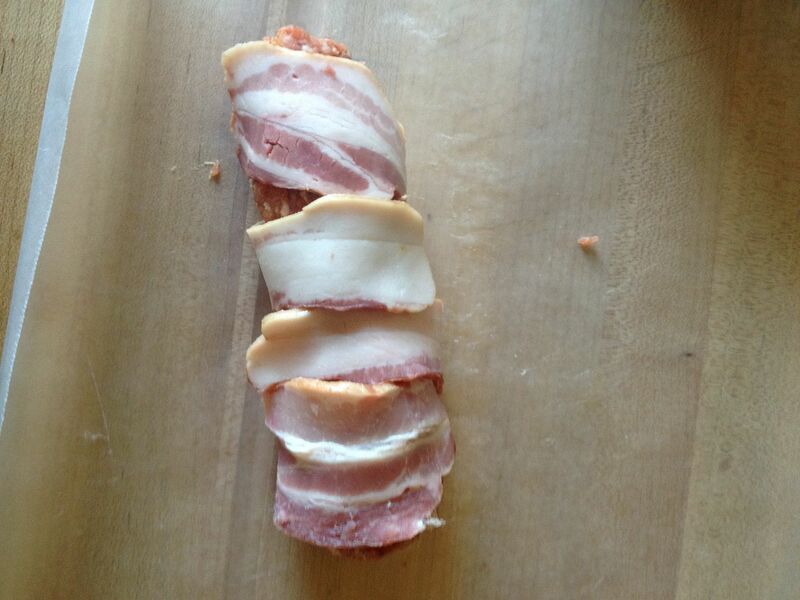 Maybe, you will see this symphony of meat entered into a future "Wrapped in Bacon" category at a future NEBS event. Don't shy away, I suggest you give this recipe a try when your inner caveman is yearning for some meat. Or, when you have been on a diet and deserve a little treat. Gus, beware. These are not for the faint of heart. But, they were good for sure. I think the diet has made you loopy. Facebook and espresso enemas? 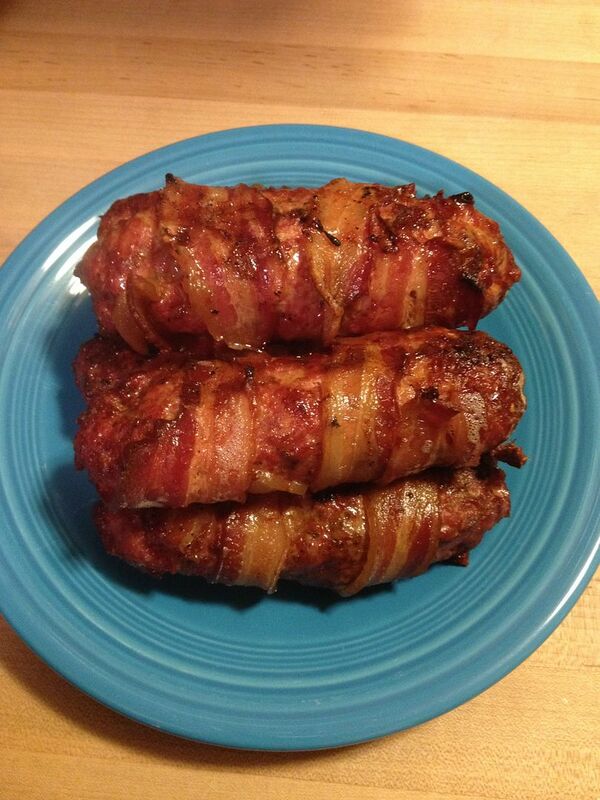 I jest because that bacon wrapped fatty sounds delicious. Life in moderation is what I always say but do not practice.